Hi, my name is Olivia and I have a garlic problem. Am I alone in the world? Do you feel the same? About the garlic, I mean… Not the vampires! I had ordered a few steaks (more like a whole container!) from Omaha Steaks and got really excited when the delivery guy knocked on my door. As soon as I opened the cooler, I knew exactly what I was going to do with the filet mignon. My husband is part of the “men love steak” cliche. When I met him he survived mostly off of steaks and milk. Now I like to believe I’ve influenced him into developing a more sophisticated palate. The truth is I can make a very complicated dish, but if there’s steak instead, he’ll go for the steak. The steak always wins! Good thing this dish is… steak, so immediate husband-pleaser! But also me-pleaser because of the mountain of garlic that goes on it! The dish that inspired me is called “Filé do Moraes” (Moraes’ Filet) and it’s served in a restaurant called “Rei do Filet” (King of Filet) in Brazil. 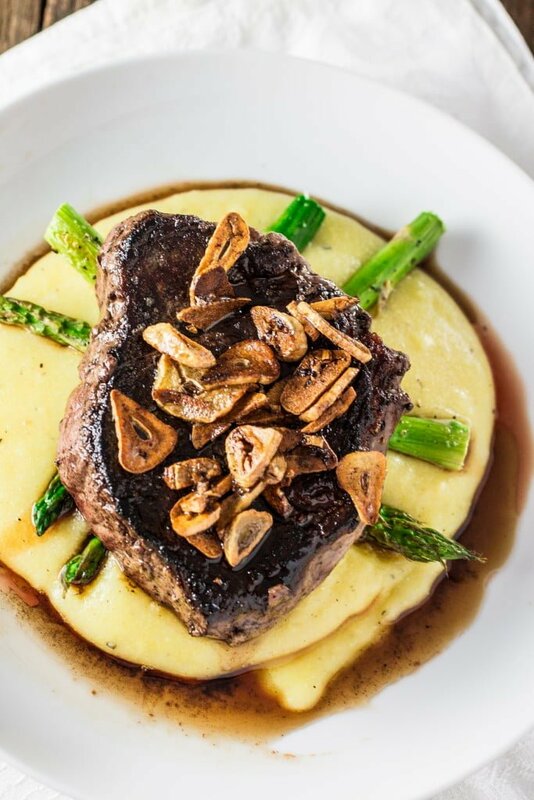 It is the place’s hallmark and it consists of a 18oz filet mignon steak with lots of garlic, served with broccolini sautéed with even more garlic. This dish is definitely not for the faint of heart. But I have faith in you! It’s garlic mania time, my friends, and we are going all in! P.S. 2 Wanna keep in touch? Follow me on Facebook, Twitter, Instagram or Pinterest to stay up to date with my posts! If you end up making one of my recipes, I would love to see it! 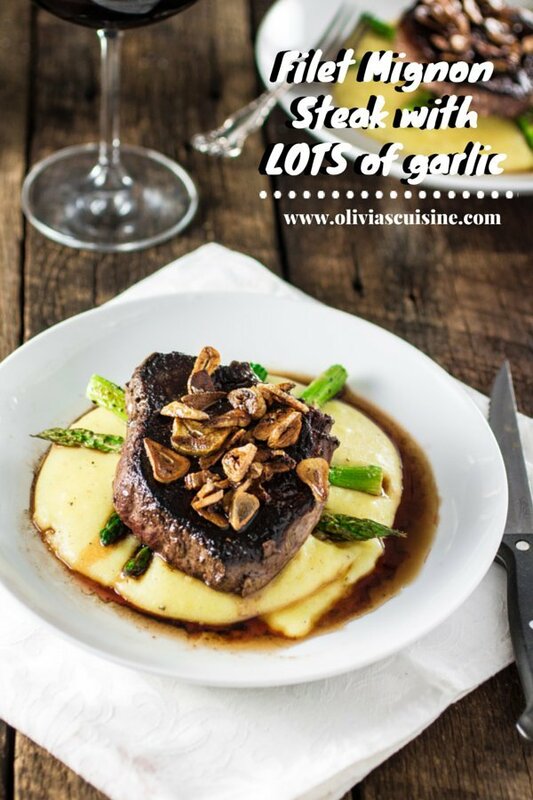 Just take a photo and post it on your preferred Social Media and tag me or use the hashtag #oliviascuisine! Pat the steaks dry with paper towel, season with salt and pepper and rub them with some of the olive oil. Preheat a medium skillet (the 2 steaks should fit snugly in one layer), over medium high heat, until almost smoking. Transfer the meat to a serving dish and let them rest for 5 minutes, or while you prepare the garlic. In the same skillet, add the olive oil and, once hot, sauté the garlic until brown (about 2 minutes). Season with salt and pepper and pour on top of the filets. Serve with your choice of vegetables, mashed potatoes and/or polenta. Actually drooling on my keyboard at 6.48am- That dish looks amazing! filet mignon AND lots of garlic? send some my way, please! I am not a meat eater but the rest of my family is and they would love this! No doubts about your father and brother become simply crazy about your “Filet with lots of garlic” recipe!!!! They are inconditional fans of King of Filet, here in São Paulo! The next time they go to your house, you have no doubt that you will have to do a lot of this filet for both! And I’ll try to cook it myself indeed! All that garlic looks SO good.. as a serious lover of the stuff, this is a recipe I have to try. Oh Wow, those are stunning pictures. We Can’t wait to give this a try! Plus, no judgment here. I just saw my wife get teary-eyed after the finale. 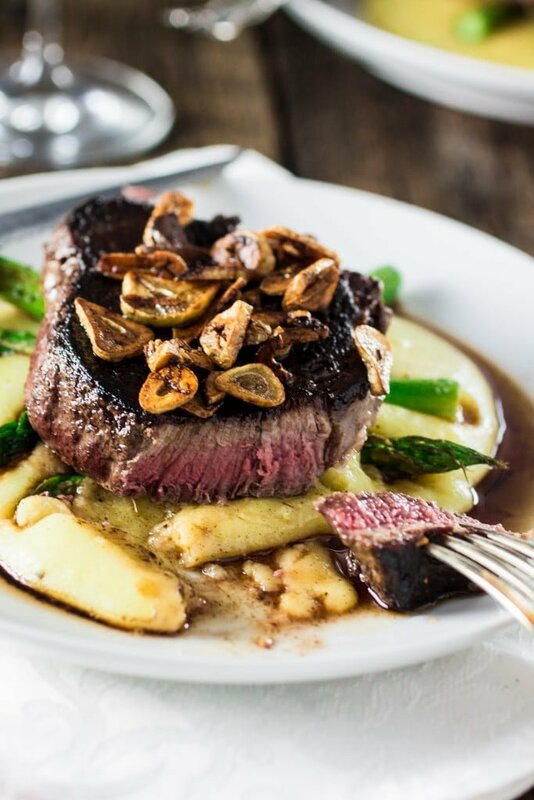 ooooooooooooooooohhhhhhhhhhhhhhhhhh it’s so amazing filet and recipe. I loved it I love it and I ‘ll love it.